A Morse code software program that will translate text files to Morse code. Code Weaver is a fun and educational program that outputs text files as Morse code. It is supplied with a library of assorted sounds including Morse code at 20 to 100 wpm. The package includes other novelty code sounds such as simulated transmissions from antique spark transmitters and telegraph key sounds. The program is not limited to Morse code, you can add any custom sounds that your PC soundboard is capable of playing. Full instructions for adding your own code sounds are provided in the comprehensive help topics. 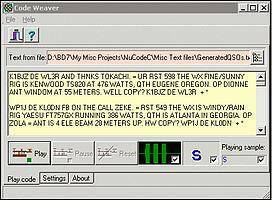 Code Weaver is a simple morse code program that reads characters from a text file and then plays audio samples in sequence. Each audio sample is selected by the current text character in the text file being read. By default each audio file contains Morse code and so the program functions as a text to Morse code generator. full instructions on adding extra sounds are included. The program is not limited to Morse code, you can add any custom sounds that your PC soundboard is capable of playing. XP/Vista compatible. Car Organizer - A Windows software for car collectors and hobbyists who want to organizer information about their favorite car models, car dealers who want to create a virtual car catalog, and individuals shopping for a new car. Collectibles Organizer - Collectibles Organizer Deluxe is a Windows software that allows collectors, hobbyists, dealers, and clubs to organize, catalog, and manage all collectibles on their PCs. Best Tarot Pro for Windows PC - By the Tarot reading a person may be able to find answers about his/her hopes and wishes. This program uses 'The Celtic Cross spread'. Color By Number - Color By Number lets you to convert photo to a paint-by-number pattern. Specimen Catalog - Specimen Catalog helps you to manage your collection of shells, butterflies, rocks, minerals, or other specimens. Single user licence for NavTools Meteo - NavTools Meteo is a small and easy to use program to order weather charts / forecasts / hurricane warnings / etc from Internet via the free NOAA Internet servers.